Paul Signac’s enduring fascination throughout his career was with the effects of colour and light upon water. A pioneer of Neo-Impressionism, Signac worked closely with Georges Seurat to develop a dazzling new technique of painting that juxtaposed touches of pure complimentary colour to create luminous harmonies, perfectly suited to capturing the changing conditions of rivers and seas. In this delicate watercolour Signac turns his attention to the dappled surface of the Seine beneath the Pont des Arts in Paris. While Signac moved away from the rigid dots of the Pointillist method in these later works on paper, his Divisionist palette is apparent in the expressive mosaic of tone. In this radiant and energetic use of colour across the structure of the bridge, tree branches and shimmering reflections of the water, Signac is able to convey the life and vitality of the river. Signac began to experiment with watercolour in 1888 under the guidance of Camille Pissarro, who felt the immediacy of the medium would suit Signac’s interest in the fleeting movement of water and sky. “In just a few minutes”, Pissarro suggested, “you can take notes that would be impossible by other means - the fluidity of a sky, some transparent effects, a mass of small pieces of information that cannot be conveyed working slowly”. Following Seurat’s death in 1891 Signac devoted himself to watercolours, referring to his ‘plein air’ studies as direct “notations” of the ports that he visited along the coast of Brittany and the Mediterranean. In this painting of the Pont des Arts Signac pictures one of his favourite bridges in the city, which he would often cross to reach the Musée du Louvre from his apartment on the Left Bank. As a link between the Palais des Arts and the École des Beaux Arts, the bridge formed a central point of activity, captured here in the bustle of pedestrians and boats. 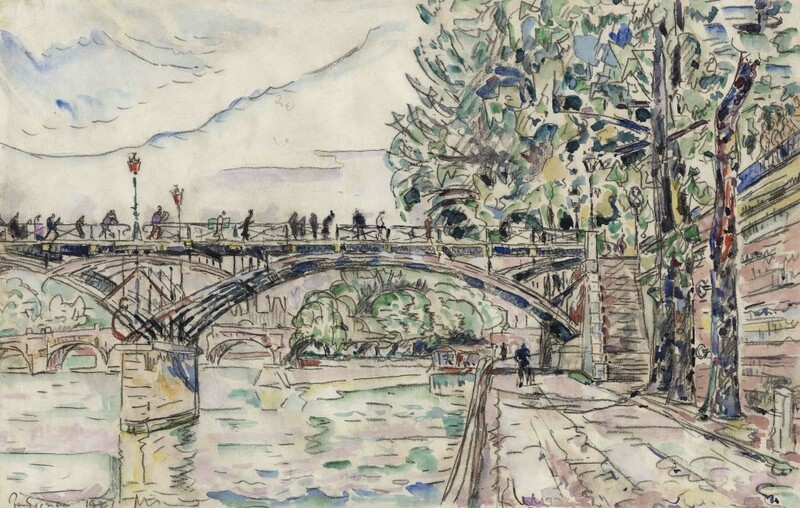 He made a number of studies and paintings of the bridge from varying angles and in different seasons, including ‘Le Pont des Arts’ (1912, Museum Folkwang, Essen) and ‘Pont des Arts. Automne’ (1915, Musée du Petit Palais).